At the beginning of this year, Marantz impressively underpinned its standing in the hi-fi sector with its high-end combination of SA-10 and PM-10. The manufacturer now apparently has similar in the home theater division: The new 11.2-channel AV receiver SR8012 offers some audiophile details, which is rare in multi-channel amplifiers. Before we jump on the subtleties of the audio architecture, let’s first say a few words about the main aspects of the video section. It was speculated for a while whether Marantz would probably already support the latest version of the HDMI standard (HDMI 2.1). However, since there was a delay in finalizing the new HDMI specifications, this was unlikely from the outset. It remains so officially at HDMI 2.0b, but at least one feature of the upcoming HDMI 2.1 standard – the eARC (Enhanced Audio Return Channel), which also Dolby Atmos and DTS: X transmits – be subsequently implemented by a software update. As soon as we have more information in this regard, we will submit it here. Not least because of this upgrade, but are worried that it comes in the near future to unpleasant compatibility problems or the Marantz SR8012 suddenly belongs to the old iron, from our perspective unfounded. This also shows a look at the other specifications of the video processing: Passing through 4K / 60 Hz signals, 4: 4: 4 Pure Color Sub-Sampling, BT.2020 Support and the three HDR standards HDR10, Dolby Vision and HLG (Hybrid Log Gamma) – everything on board, everything implemented in outstanding quality. The high standard is also underlined by the ISF certification. All the tools for a calibration according to the ISF specifications by a trained technician are available, it also profiles for different playback situations can be saved (ISF Day, ISF Night). Digital video signals are fed in via a total of eight HDMI inputs (seven on the back, one on the front), and three HDMI interfaces on the output side. In addition, there are also analog video or component connections in cinch format. Pretty much every source or playback device should be connected here. Digital video signals are fed in via a total of eight HDMI inputs (seven on the back, one on the front), and three HDMI interfaces on the output side. In addition, there are also analogue video or component connections in cinch format. Pretty much every source or playback device should be connected here. But let’s get to the real paradox of the SR8012 – the playback of up to 11.2 or 7.2.4 channels in impressive quality thanks to the very high-quality constructed amplifier architecture. Around the generously dimensioned toroidal transformer – rather a rarity in the AV area – and the inner cooling fins are grouped eleven separate boards, which each connect the components for the individual amplifier channels. The entire arrangement, as well as all the other boards, are encased in a largely copper-plated chassis – an idea that was recently prominently featured in the 10 series and ensures effective shielding of the modules. Also adopted were the HDAM modules, a technology specially developed by Marantz, which is used as a sonically superior alternative to conventional operational amplifiers. With four of the proven SHARC D / A converter chips, Marantz also ensures that the conversion (up to 192 kHz, 32 bits or DSD 5.6 MHz) takes place at the highest level. Since the SR8012 obviously does not lack audiophile qualities, the comprehensive streaming integration is all the more enjoyable. Communication with the in-house network is either via LAN cable or via the WLAN antenna, a Bluetooth module is also available. From iOS devices can be streamed via Apple AirPlay directly to the SR8012, the front USB input also brings music to the AV receiver. In addition, thanks to the cooperation of Denon and Marantz, HEOS multiroom technology is an integral part of the SR8012 right from the factory. 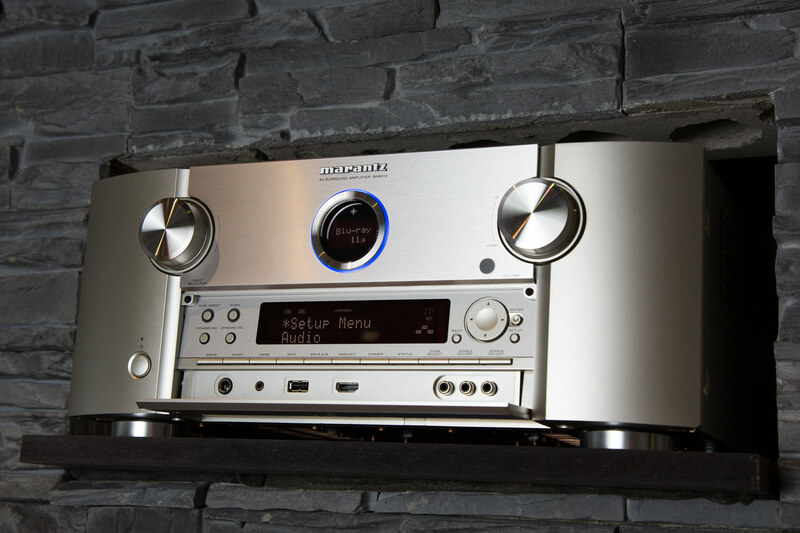 Not only can the Marantz receiver be embedded in a HEOS multiroom system, but there are also a variety of streaming providers (Spotify Connect, Amazon Music, TIDAL, Deezer, JUKE! ), Internet radios and local music libraries Network have been released through the HEOS App. 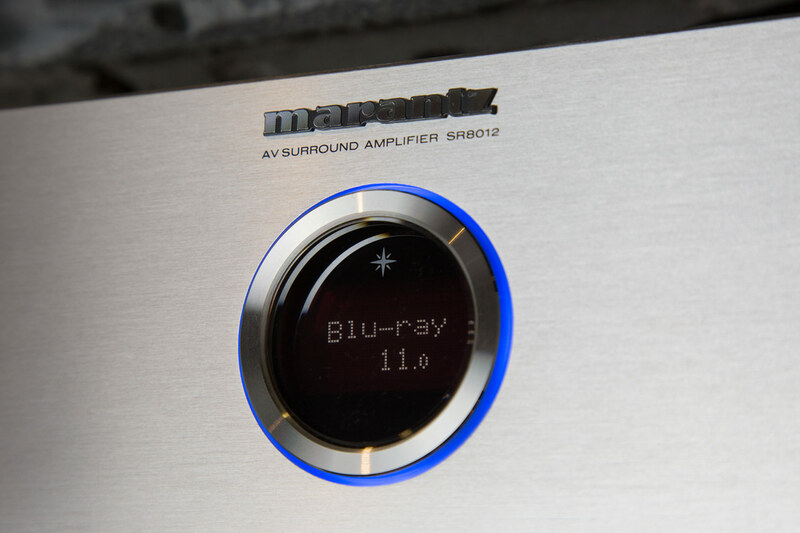 At the same time, the Marantz App is available for the control and setting of all functions that fall into the actual core competence of an AV receiver. Of course, two features of the Marantz SR8012 should not be missing when it comes to sound. On the one hand, Marantz – which should be rather unusual in the AV sector – actually installed a phono preamplifier for Moving Magnet (MM) pickup systems, and on the other hand – this is less unusual, but still worth mentioning – the Audyssey calibration system Integrated MultEQ XT32. In addition to a sophisticated frequency and dynamic correction, this includes special filter algorithms for the low-bass range as well as the option of perfectly matching two simultaneously used subwoofers. If that’s not enough, the Audyssey MultEQ app can make many additional adjustments and save them as presets. 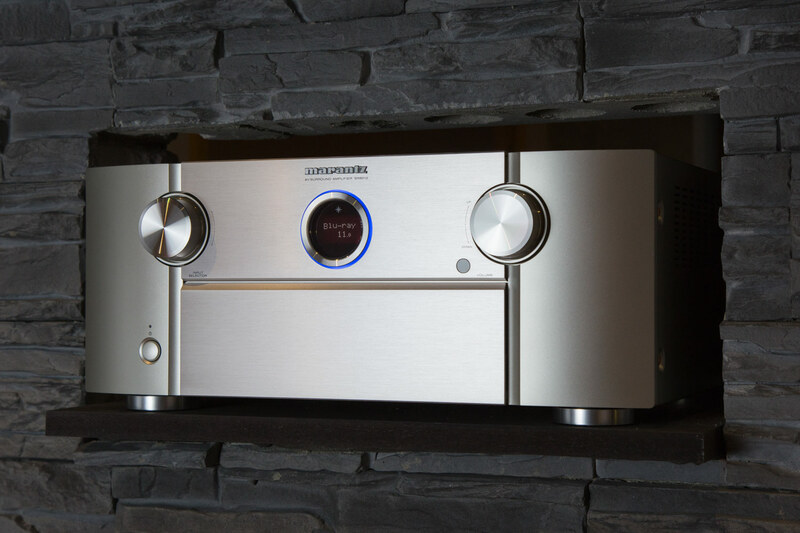 With the SR8012 Marantz complements its AV receiver series with a new top model. Compared to previous years – remember the introduction of 4K, HDR, 3D sound formats, etc. – at first glance, there does not seem to be any technological quantum leaps. However, that a lot of work has flowed into the details, apart from the big keywords, you can feel immediately when you experience the SR8012 in action.